Happy Friday! 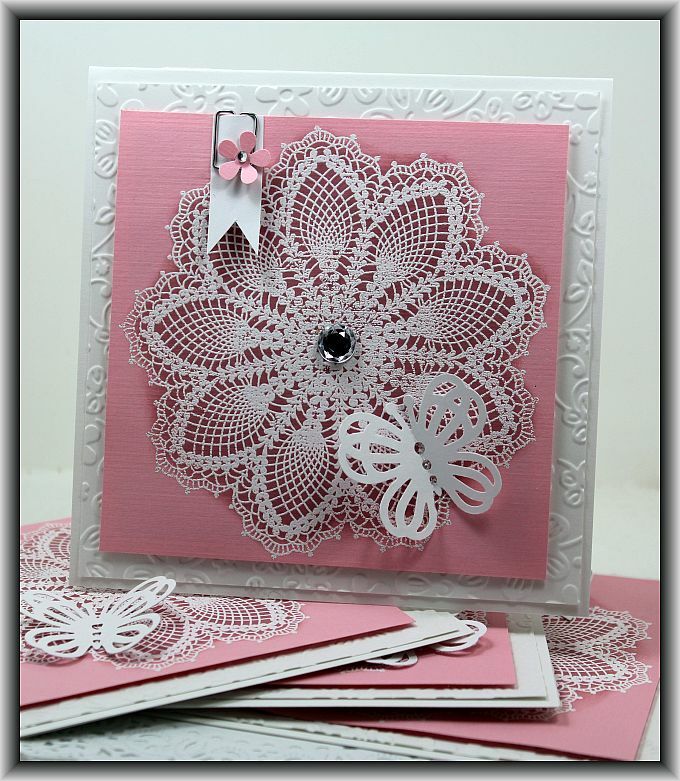 I thought I would take a break from posting Christmas cards and post a pretty card that I made using my Hello Doily Stamp…. This is one of my go to cards, I make these in several colors and keep a bunch of them in my stash for birthday cards for my special friends. I have several card designs that I keep for this purpose. I made these in purple as well and I also like to make them in blue. Well I am off to get ready for work! I hope you all have a great day! I have a quick post for you this morning before I head off to work. Kim got in some lovely new stamp sets this week and one really caught my eye. 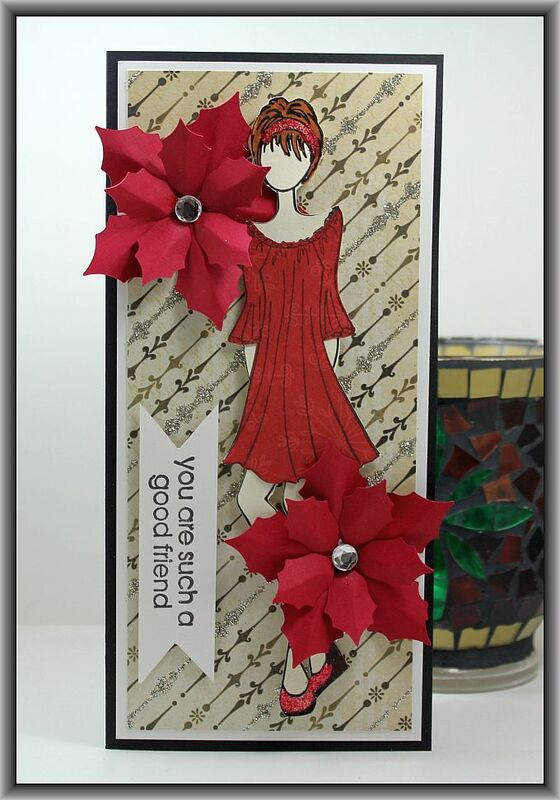 I love beautiful sentiments and this she got a set in that would work perfect on the longer cards I have been making lately. 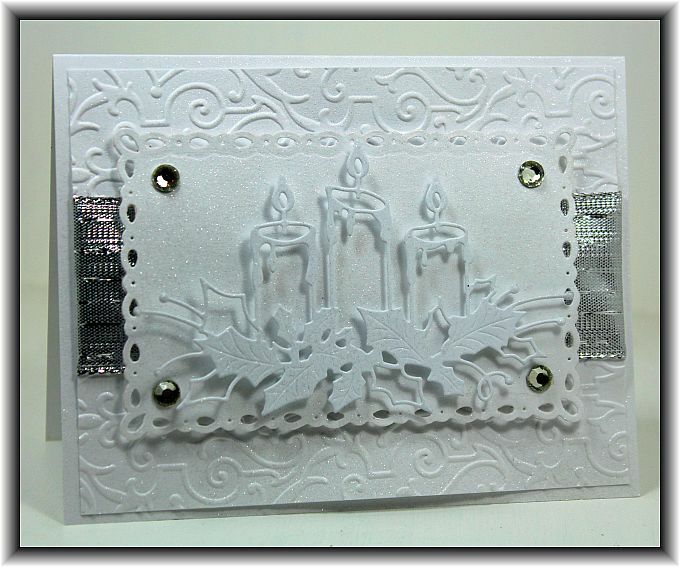 This card measures 8 1/2 by 4″. 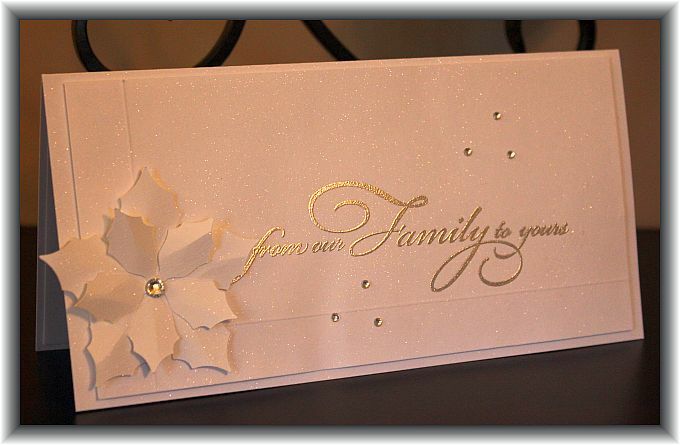 Sorry about the quality of this picture, I have trouble getting a good shot of the all white cards in my light box so this one was taken in my dining room. 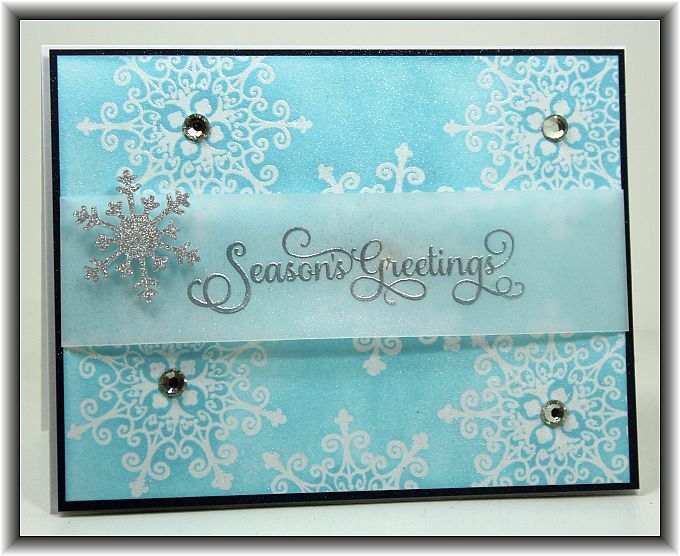 This is a very quick and simple card to make up when you are in a hurry to get your cards done. 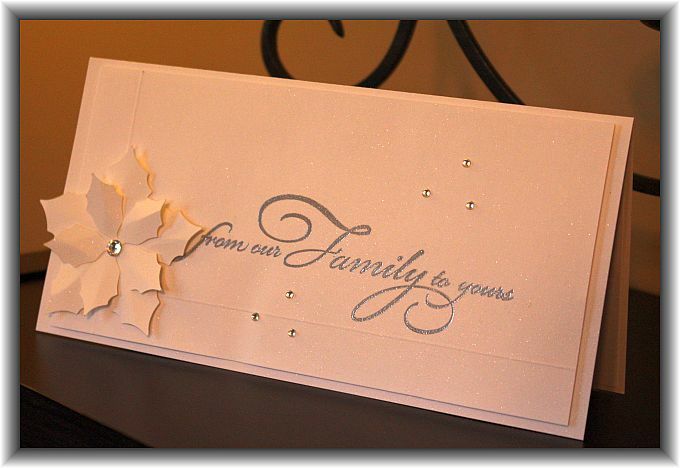 Just a couple of score lines, heat emboss the sentiment and pop on the poinsettia and a few gems and you are done! I added some pretty sparkle shimmer mist to give it that finished touch. I hope you all have a great day and thanks so much for stopping by! I have been posting so much for The Cutting Garden, I am getting behind with posting to my own blog! I am heavy into class mode for Kim at the store! 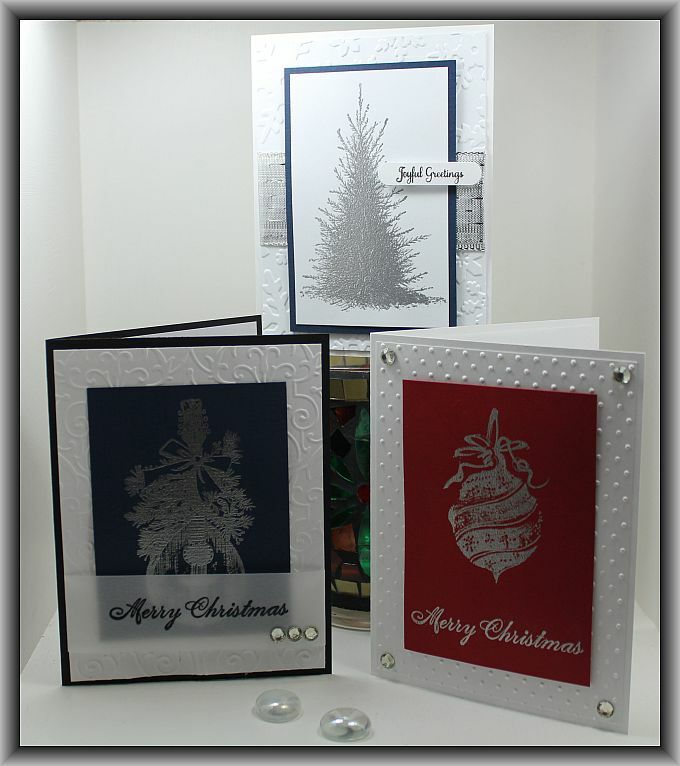 The Christmas rush is on and everyone is asking for classes because they want to get their Chirstmas cards done! Here’s another class that I am putting on at The Garden…. This is a really simple mini stamp a stack where the ladies will go home with 5 of each of these cards. I hope some of what I post here gets you inspired to get crafty! Have a fantastic day and thanks so much for stopping by!!! 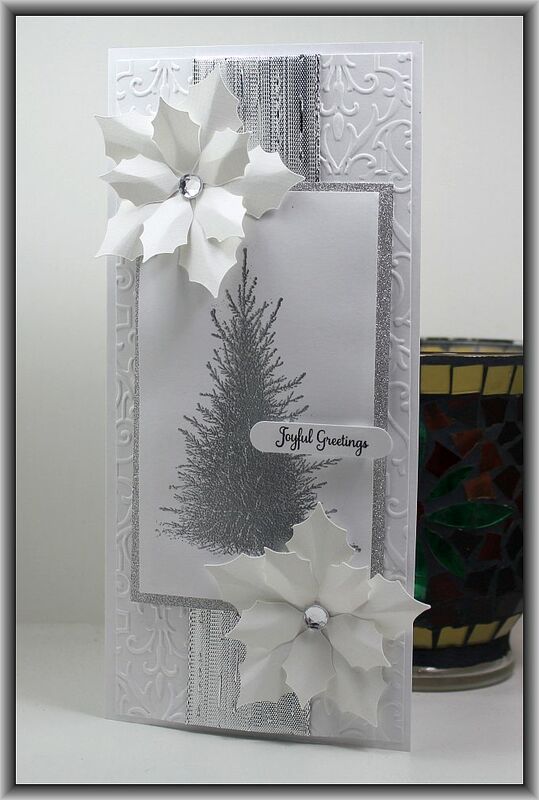 Prima Doll Friendship Christmas Card…. I have a fun Friendship Christmas Card to share with you this morning before I head off to work…. I decided to use my Prima Dolls to make some pretty friendship Christmas Cards. Using my Cameo makes it so much easier to cut them out 🙂 Check out the pretty glitter Christmas paper that My Mind’s Eye has out this year! Kim has loads of this in stock at the moment so grab some up before it’s gone! I am off to get ready for work! I hope you all are having a fantastic week! Finally Making Some Christmas Cards! I have to say…. so far, this year this card is my favorite. The picture doesn’t do it justice… I is so pretty, it just sparkles! The tree stamp is by Memory Box that I picked it up at The Cutting Garden and I cut the poinsettia’s out with my cameo. 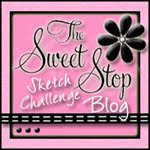 Stay tuned… I am going to post some Christmas Blog Candy by this weekend and all my followers will have a chance to win! 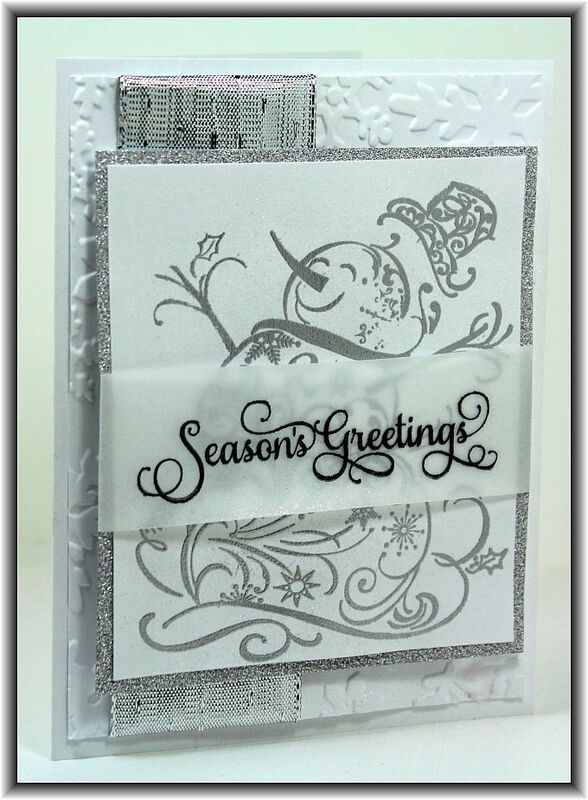 The Blog Candy will include a couple of Christmas Card kits and this card will be one of them! So share this info with your friends if you like! 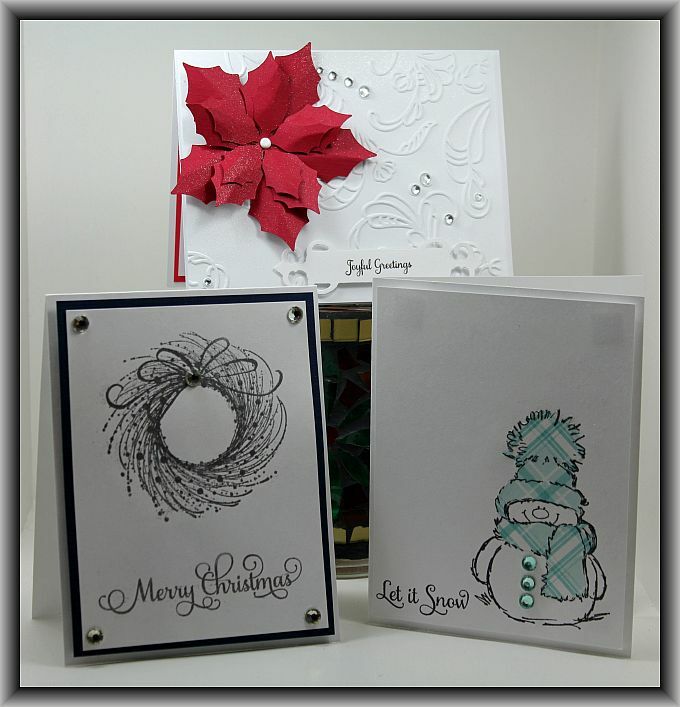 This one is going to be a bit of a mini stamp a stack as we will be making 5 of each of these cards. It should be a fun class, we always have a lot of laughs. Today is day 28 of being a non smoker… Tony and I are still doing great and staying strong! I am off to work again today so I had better get my act in gear and hit the shower. I hope you all have a fantastic day and thanks for stopping by! This is three cards that I put together for an upcoming class at The Cutting Garden. I have managed to make some extra for my Christmas card stash as I am seriously behind with this!